Even the greatest pair of kids’ shoes is meaningless without comfortable socks or hosiery; you can’t go very far without them! I like to think of pediped’s new Tights and Socks as the perfect accompaniment to its fashionable, yet functional footwear, which we reviewed last year. They are well-made, eye-catching (shown here in bubble gum pink)and meant to take your child through any number of paces. If I look at my 5-year-old’s typical day, that means moving from the bus stop, to the classroom, onto the playground and eventually back outside into the yard (weather-permitting, of course). I like that when we wait for the bus on our blustery, waterfront street, her toes haven’t turned into icicles before boarding. 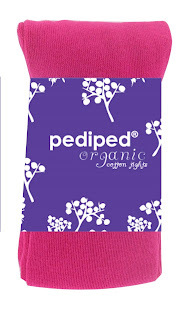 pediped’s tights are made from pima cotton, which keeps her warm, but not feeling overheated. A touch of Lycra in them gives her the freedom of movement–and with all that aforementioned activity, it’s a must for any busy gal! In a Nutshell: Don’t skimp on socks; protect your kids’ feet with quality socks and tights that will keep them light on their feet. While you’re at it, check out the organic line of socks and tights, too.